Here it is November with Christmas creeping towards us, and it is damn cold here in Seattle. 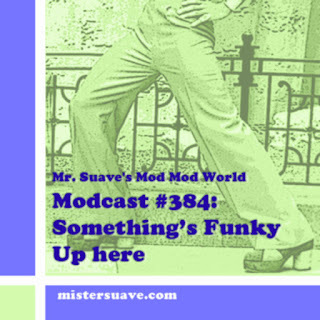 So to help warm the blood I've got another great set of songs for this, the 76th installment of the web's original modcast, Mr. Suave's Mod Mod World. Kicking things off is a great bit of power pop from BBC DJ Mike Reid's group The Trainspotters. The story behind this one is interesting to say the least. Reid is probably most famous for being the DJ that vaulted Frankie Goes to Hollywood to #1 hit status -- completely unintentionally. The story is that one day on his BBC show Reid started playing a new single from Frankie called Relax, without ever having listened to it first. While it was playing he listened to the lyrics and got so enraged that he pulled the record off the turntable in mid-song and broke it half right on the air. Within hours the BBC had banned the song from all of its stations. It was then that the law of unintended consequences kicked in and within a few days the song was #1 and Frankie Goes To Hollywood became megastars overnight. There's a few lessons in there to be sure. The rest of this modcast is a lesson in pure power pop. So get yourself a lusty libation, sit back, relax and enjoy the sounds.